Many of us have closets full of shoes designed for every purpose and every occasion. These shoes not only support and protect our feet they often reflect our personal style. While most choices are equally influenced by comfort, purpose, and design, there are times when fashion is our main criteria in selecting footwear. Unfortunately fashion and foot health are sometimes not entirely compatible. This is definitely true in the case of very high heels. As good as we may think we look when wearing high heels, the human foot and musculoskeletal system is not designed to function at its best in this type of footwear. Healthy walking involves a heel to toe movement that occurs when the leg is at about a 90-degree angle to the foot. In this relationship the ankle joint can employ a comfortable range of motion and sustain us during normal daily activities. However, when high heels are worn the position of the foot is unnaturally altered impairing healthy function and putting entire muscle groups, bundles of tendons, and our very bones at risk. Despite the fact that high heels are one of the leading causes of foot problems and can precipitate a host of other medical problems in women, they remain a popular and fashionable footwear choice. According to recent studies nearly half of all women wear high heals with one in ten women wearing them at least three days a week. Extremely high heels contort your foot into what is known as a “plantarflexed” position. Think of it as standing on your tiptoes for hours. This position impacts your feet as well as your overall musculoskeletal system. In general wearing heels that are higher than two inches causes the foot to slide forward putting more weight on the toes. This produces a change in posture as the body leans backwards while overarching the back to maintain an upright position. Although in the short term this adjustment may feel comfortable, it actually strains the lower back, knees, hips, and even muscles in the neck. High heels also put excessive pressure on parts of the knee joint and can cause pain, lead to arthritis, or make an existing arthritic condition even worse. Beyond an effect on your posture, frequent and prolonged high heel wearing can result in changes to your normal gait. The result is one that is less fluid. Furthermore, a lot of walking in this type of footwear can alter the structure of the muscles and tendons in the calves. The muscle fibers in the lower leg will become shorter and the Achilles tendon will shorten as well as tighten. These changes reduce the ankle’s range of motion, cause muscle fatigue, and can contribute to a number of conditions such as Achilles tendonitis or plantar fasciitis. In addition to all of those already mentioned, podiatrists also see a number of other problems within the foot associated with excessively high heels and squishing the feet into a narrow toe box . 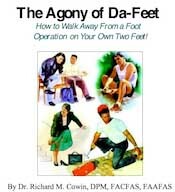 These include ingrown toenails, calluses, painful corns, bunions, hammertoes, capsulitis (painful inflammation of the toe/ foot joints), neuromas, and stress fractures. If you still need another reason to select more sensible footwear, perching precariously in towering heels has been demonstrated to increase one’s risk for acute foot and leg trauma. In fact according to a recent study the incidence of high heel related injuries treated in the emergency room has doubled from a little over 7000 in 2002 to approximately 14,000 in 2012. For those who like and want to continue to wear high heels, podiatrists recommend some simple footwear adjustments to minimize the consequences to your foot health and overall well being. For one thing, it is best to avoid narrow, stiletto-type heels and heels higher than two inches. A shoe with a lower heel that has a wider chunkier base presents a lower risk. In addition, it is important to make sure that your shoes fit well so that your feet do not slide forward and that they have have a wide enough toe box that does not place excessive pressure on the toes. Finally, soft insoles can help to reduce the stress of on your knees, while taking the time to stretch at the end of the day serves to relieve tension in the calf muscles and feet. As with all things, the key to avoiding the foot problems associated with today’s extremely high heels is moderation. Wearing your high heels for shorter periods of time and alternating your shoe choice over the course of the day, or from one day to the next is important. One piece of advice is that when commuting to and from work or a special event, wear a good pair of athletic or walking shoes. Only put on your high heels when you arrive at your office or formal destination. Fashion and foot health do not need to be mutually exclusive. With an almost infinite number of designs to choose from, it is possible to find shoes that both look good and feel good. Since healthy feet are essential to a balanced body, it is always important to pay close attention to your feet and to make the correct footwear choices.